The story of Aliens continues with exquisite attention to detail. Alien 3 has its fans, but sci-fi buffs everywhere have been waiting since 1986 for a real sequel to James Cameron's Aliens. The timeless story of Ellen Ripley's disastrous journey to LV-426 has enchanted two generations of filmgoers, but while her adventure continued through two more films, the popular Colonial Marines disappeared into the annals of Hollywood history. Not content with leaving the marines in cold storage, Gearbox Software is set to return to the home world of the xenomorphs and finish the fight once and for all in Aliens: Colonial Marines. During a press event at New York Comic Con 2012, Randy Pitchford, president of Gearbox, described Aliens as "a film I've been stealing from my entire career." Working alongside Ridley Scott, director of the original Alien and prequel Prometheus, was a dream come true for him. With the director's blessing, Pitchford and his team set about creating a real in-canon sequel to Aliens that incorporates the movie's locations, weapons, creatures, and even a few of its actors - namely, Lance Henriksen (Bishop) and Michael Biehn (Hicks). 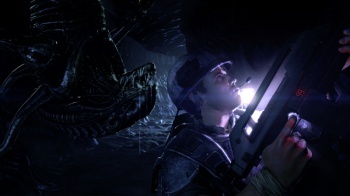 Aliens: Colonial Marines takes place shortly after the events of Alien 3, and puts the player in the role of Corporal Winter, a member of the team sent to investigate the Sulaco crew's disappearance. After arriving in the system aboard the Sephora, Winter and his team discover that the xenomorph threat is still very real, and they will need to finish the job that Ripley started. Pitchford showed off two of the game's levels: a creepy tour of LV-426's surface, and a firefight aboard the Sulaco (although in the game's campaign, the second level actually takes place first). The LV-426 level begins with Winter's team landing in the middle of its unfriendly terrain. The landscape is an eerie blue and infrequent lightning strikes in the background help to heighten the mood. The gameplay during this section was fairly typical for a first-person shooter, with one notable exception: there was no shooting. Winter spends a good ten to fifteen minutes simply wandering around the beautiful, barren landscape, listening to com chatter, collecting dog tags from the original Aliens marines, and revisiting iconic locations, such as the crash site of Ripley's APC. This setup, as well as Winter's first assignment to set up four signal boosters, show that the game, like the films, is as much about tension-building suspense as it is about action-packed payoff. The Sulaco level was a little more straightforward, although it also provided some tantalizing hints at the larger story. Since Ripley and the marines disobeyed Weyland-Yutani's orders at the end of the second film, the corporation has decided to send its PMCs ("Like Blackwater," says Pitchford) to wipe out the rescue team. Even as xenomorphs attack all humans aboard, the Weyland-Yutani PMCs do their damndest to wipe out Winter and his team. This level felt more like a traditional shooter, although the level design was impressive, and the three-way battle looked like a lot of chaotic fun. The word that best sums up Aliens: Colonial Marines is "detailed." Gearbox obviously has a lot of love and respect for the Alien franchise, and a thousand little touches (like the xenomorphs' acidic blood damaging Winter if he gets too close) boost what looks like a solid shooter into a project that's worth a look for any fan of the movies. Players can experience the campaign either alone or cooperatively from start to finish, and a competitive multiplayer mode that pits marines against xenomorphs looks very different from the standard FPS deathmatch. Expect the game to hit shelves on February 12, 2013 for the 360, PS3, and PC, with an eventual Wii U release later down the line.